Thus in the simple present tense start with the root e.g. ken, greet (with tae this is known as the infinitive i.e. tae ken, tae greet) and add -s for the she/he form (but see below). For verbs ending in -sh, -lch, -nch, -rch or -tch, add -es e.g. she nivver fashes (worries). The ‘you’ plural youse, seems to have spread from the West, but ye as a plural is also used. the lassie eats a fish supper, the lassies eats fish suppers. Many speakers however now use the English-like plural form (i.e. they drop the -s). Thaim that kens aw aboot it… (Those who know all about it…). This feature even has a name, the ‘Northern Concord Rule’, as it is also found in northern dialects of English in England. A ‘present-historic’ narrative form is very common, adding an -s, is often used when telling stories. The ‘present-historic’ form can also indicate a repeated action. Whan A gets hame A aye mak ma tea. The present participle is formed by adding -in to the root e.g. stert, stertin. If the root ends with a consonant after a single vowel, double the consonant e.g. ken, kennin; mak, makkin. Verbs ending in -e drop the last vowel e.g. come, comin; ettle (try), ettlin, and verbs ending in -ie change the spelling e.g. cairrie, cairryin. The only real irregular is the verb gae (go). Although gaein is used, the form gaun is just as popular. The spoken contraction gaunae, often replaces gaun tae before a verb. (but A’m gaun tae the gemm if not followed by a verb). The present participle is used more in Scots than in English. Again this could be a Gaelic influence. A’m thinkin he’s no in. As in English, the present participle is used to form nouns such as biggin (buiding) and flittin (house moving). The simple past tense of regular (‘weak’) verbs is formed by adding -it, –t or – ed to the root. The rules seem quite complicated but really follow the sound of the root and you do get used to them. As in all Anglo-Saxon languages, many common Scots verbs are irregular (also known as ‘strong’). This means that their past tenses and past participles do not follow the rules above. There are considerable differences between Scots and English in this respect. Verbs which are irregular in English may be regular in their Scots equivalents: keep, keepit; sell, sellt; tell, telt; while several verbs which are regular in English are irregular in Scots e.g. quit, quat; hit, hut. To make matters more complicated, a few Scots verbs have both regular and irregular forms of the past forms e.g. stick has the forms stickit (regular) or stack (irregular). Unfortunately all you can do is learn them as you go along. The list is long and some may now be rare but some of the most common ones are as follows (the past participle is also given – see Perfect tense below) The Essential Scots Dictionary has a fuller list. The perfect tense normally uses the present tense of hae / hiv (have) with the past participle in a similar way to English though the forms often differ – hae / hiv is described later. Unlike English jist (just) doesn’t need to take the perfect; Jamie jist cawed (Jamie has just called). In English, will and shall can be used almost interchangeably to form the future tense. This is not the case in Scots, only will (or wull) or the abbreviated form ‘ll simply implies future action but s(h)all, when used at all, in Scots always implies assertion. To a Scot, A wull gae tae the pub the nicht and A shall gae tae the pub the nicht state quite different levels of commitment to pub-going. The immediate future tense is widely used A’m gaunae gae tae the pub, meaning I’m about to go. Hoo auld’ll yer faither be? A’ll no gae tae the pub or A wunna gae tae the pub. Wull ye no gae tae the pub? Scots no is used generally in the same ways as English not e.g. A’m no gaun oot. Nae carries out this function in the North East dialect; otherwise ‘nae‘ before nouns is the equivalent to English ‘no’ e.g. Therr nae luck aboot the hoose. Note however the auxiliary verbs (as with wull above) have particular negative forms (see below). Negation is quite flexible in Scots e.g Gauna(e) no dae that! (Don’t do that! ), He isna still no warkin? Multiple negation is quite common, reinforcing rather cancelling out A’m no sayin naethin. These are regarded as colloquial. Niver, a common general marker of negation is also regarded as colloquial ; A niver did it (more ‘I didn’t do it’ than ‘I have never done it’) and nut, an emphatic variant of no especially in children’s speech; Ye wis! A wis nut! Often formed with get, unlike English even when the ‘agent’ is stated. The prepositions fae and wi are also commonly used to indicate the ‘agent’. Dinna gang hame! Don’t go home! Lat’s (no) gang hame! Let’s (not) go home! Polite ‘imperatives’ are common: Wull ye gang hame, Ye cudna gang hame, cud ye? Awa wi ye! Come off it! Awa bile yer heid! Clear off! Other adverbs can be used in the same way: Ootside! Noo! These are verbs (in English such as be, have, will etc.) used together with a main verb to expand meaning and expression. Scots usage is similar to English, but the forms are quite distinct. Be and hae are the usual auxilliaries used to build compound tenses, be is used to make the present and past progressive tenses Whit are ye daein? and hae the present and past perfect tenses e.g. Whit hae ye bocht?, Whit haed ye bocht?. Dae is the supporting auxilliary used for negatives, questions etc e.g. D‘ye ken whit’s wrang? Whit did ye brek? Wull, maun and micht are the modal auxilliaries which form the future and tenses which express uncertainty e.g. Wull ye gang the morn? Auxilliary verbs have distinct negative forms in Scots and several also have emphatic forms. 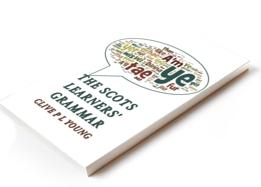 You will come across many spelling, dialectical and form variants of Scots auxiliary verbs. I’ve tried to pick a fairly conservative/neutral set here. The negative of most auxiliaries is formed by adding -na(e), to the unelided form: A’m, A amna; ye are, ye ar(e)na, ye wis, ye wisna etc. The older negative of be is binna ie binna feart (afraid) but nowadays dinna be feart would be more common. The question form Is therr? (colloquially Is they?) and the past form therr wis is similar to English. Here can take a similar form to therr; Here the buik ye gied me. The English wis bate at Bannockburn .The English were beaten at Bannockburn. There is a common alternative to hae sometimes used as an ’emphatic’ form hiv providing A’v the common elided form to A hae. The negative forms are distinct: hisna (often shortned to hinna) /, hidna etc. The past is haed(na), elided to ‘d. Hae is also of course used not as an auxiliary but as a possessive, often hae got as in English. Note the reduced forms in If a haed’v kent or colloquially If A’d haed a kent. Dae has forms dae, dis as well as an ’emphatic’ form div. The elided form of the past is’d. ‘To do’ is often written adae. Dae has an irregular negative, dinna (disna in the he/she/it form), didna etc. The past is did(na). With short verbs, sometimes you still hear a form of asking questions without dae. Hae ye onie siller? Do you have any money? Hae/Hiv ye tae gang the noo? Do you have to go now? Cam ye wi the bus? Did you come by bus? Think ye sae? Do you think so? Modal verbs such as can and wull are used in a similar way to English except for in the future tense (see above). The negative forms are wull, wullna (often shortned to winna); maun, mauna (note single ‘n’); micht, michtna, daur, daurna, need, needna. The past is usually written as wad(na), micht(na), durst(na), needed. Maun has a rarely used past bud ie it bud tae be. Negative past forms are wadna, michtna, durstna. The hae in the idiom hae better is often dropped Ye better dae it noo, A’ll better no gang. The idiom A maun awa implies the verb gang and means ‘I must go’. Daur and need (tae) are not really modals, but still take the -na(e) form that was once more widespread in Scots. She’ll can wark on it aifter . She’ll be able to work on it later. There is no direct equivalent of English ‘may’; (tae) can or get (tae) are used in the sense of being allowed to. Ye hae tae can lauch at yersel You must be able to laugh at yourself. A micht can dae it the morn I might be able to do it tomorrow. Ye can no come tae the pairtie (implies a choice).